Back in 1960, a folklorist/ethnomusicologist named Frederick Usher discovered a street singer named Eddie Jones (if, indeed, that was his real name) playing a one-stringed contraption and singing the blues on Skid Row in Los Angeles. Usher described Jones’ instrument as a “home-made African derived Zither-Monochord.” (I doubt Jones called it that.) It’s basically a close cousin of the diddley bow, another instrument with African roots. There, in some Skid Row alley, Usher recorded at least 15 songs by Jones, some with his crony, harmonica player Edward Hazelton. Four years later, the venerated folk label Takoma Records released an album of those recordings under the title One-String Blues. 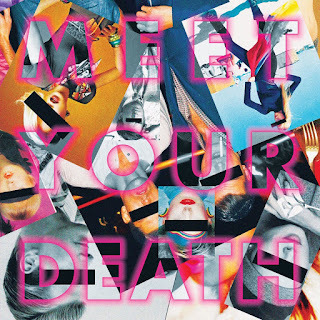 So imagine my delight when I recently came across a new self-titled album by an Austin band called Meet Your Death. 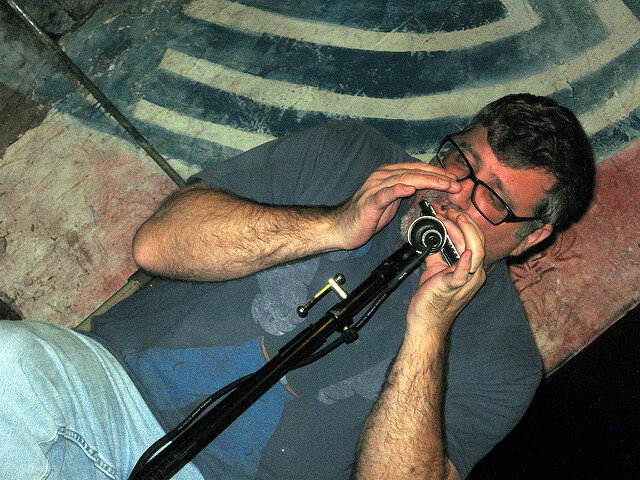 They’ve got a track they call “Elephant Man,” which is a louder, more raucous version of Jones’ one-string “Dozens.” Frontman Walter Daniels growls the lyrics over John Schooley’s apocalyptic slide guitar and then blows his harmonica as if challenging the elephant to a loser-leave-town battle. This version is based on Bo Diddley’s 1970 take on it, also titled “Elephant Man.” And even though I’m pretty sure Meet Your Death wasn’t overly concerned about getting a G rating here, they leave out the “dirty” verses. Even so, the song is crazy joy from start to finish. But even without “Elephant Man,” I was bound to love this band. I’ve been a long-time fan of both Daniels and Schooley — I even got to see them together in an acoustic setting along with fiddler Ralph White at a Beerland gig in Austin a few years ago. 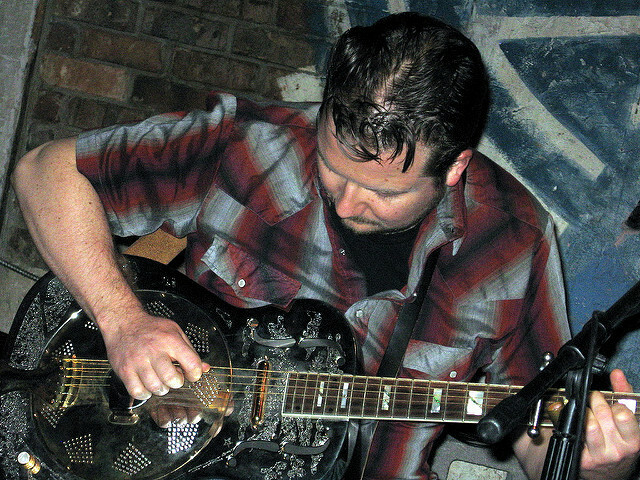 Harp-man Daniels is a longtime Austin stalwart, having played in such bands as Big Foot Chester and Jack O’Fire, which covered a Blind Willie McTell song called “Meet Your Death” back in 1994. In Meet Your Death, this dynamic duo is backed by a couple of younger guys — Harpal Assi on bass and Matt Hammer on drums. Meet Your Death plays hard-rocking punk blues covers by some great American writers like Hank Williams (“I Don’t Care If Tomorrow Never Comes”) and Mose Allison (“If You Live”). But next to “Elephant Man,” my favorite song here is the opening track, which comes from a more obscure source. “Obeah Man” is based on a song called “Exuma, The Obeah Man,” recorded in 1970 by Bahamian singer Macfarlane Gregory Anthony Mackey, who recorded under the name Exuma. Starting off with jungle drums, the song quickly turns into a hoodoo-drenched, Dr.-John-by-way-of-Bo-Diddley invocation to the ruling demons of rock ’n’ roll, with Daniels as the ragged-voiced high priest. By the end of the song you’ll believe that the singer “came down on a lightning bolt” and “has fire and brimstone coming out of [his] mouth,” as he sings. 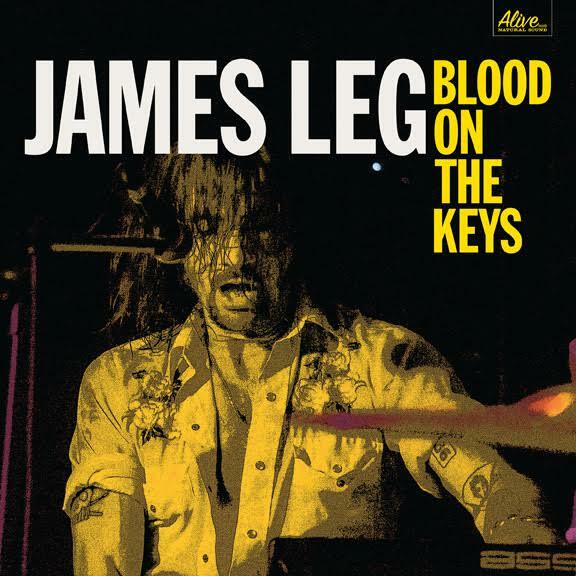 * Blood on the Keys by James Leg. If you need more of that blues-driven, rump-bumpin’, holy-roller-shoutin’, swampy rock ’n’ roll, a keyboard player called James Leg just might be your man. Leg was born John Wesley Myers. He’s the son of a preacher man, born in Port Arthur, Texas ( Janis Joplin country), and raised in Chattanooga, Tennessee (home of the choo-choo). Before launching his solo career, Leg played with a couple of notable hard-chugging bands. He fronted The Black Diamond Heavies and played in the final incarnation of The Immortal Lee County Killers, a pioneering band of the punk blues sound. Leg also recorded an album (Painkillers, 2012) with current blues minimalist titans Left Lane Cruiser. Blood on the Keys, recorded in a converted Masonic lodge in Kentucky, is a splendid showcase of what Leg does best: roaring and thundering (with a voice that falls somewhere between Captain Beefheart and Jim “Dandy” Mangrum of the band Black Oak Arkansas) over stripped-down atomic-powered boogie. A big percentage of these songs feature Leg backed by his own keyboards and drummer Mathieu Gazeau — sometimes joined by guest guitarists and, on a couple of tracks, backup female vocalists (a group called Foxxfire). And indeed, these songs — including the opener, “Human Lawn Dart”; “Mighty Man” (written by the early ’70s British band Mungo Jerry, best known for their hit “In the Summertime”); “Huggin the Line”; and “DogJaw (Do Some Things You Say)” — are guaranteed to get the crowds moving. But there are a handful of outliers here too. One of the most memorable songs on the album is “Should’ve Been Home With You,” penned by the late Austin songwriter Blaze Foley. This minor-key tune rocks with just about as much intensity as any other on Blood on the Keys, but the demonic fiddling of Sylvia Mitchell gives it a sweet touch. I’m glad that Leg’s blues bruisers outnumber his ballads. But there’s nothing wrong with a little variety. And finally, I couldn't find "The Dozens" by Eddie "One-String" Jones on YouTube, Spotify or anywhere else. But here's a video of Jones doing "Baby Please Don't Go."